Scarce thematic broadside illustrating the 1896 Bryan - McKinley Election. The Silver Dog withteh Golden Tail. Will the Tail Wag th Dog, or the Dog Wag the Tail? An uncommon 1896 broadside political cartoon depicting a porcine dog embraced within the framework of a United States map. This caricature, created by the Pueblo Lithograph Company, serves to humorously illustrates the major political debate driving the 1896 presidential runoff between Republican William McKinley and Democrat William Jennings Bryan. The elections primary issue was the replacement of the established gold standard for a silver standard. Previously the United States operated on a bi-metallic system, wherein both gold and silver coins were minted, representing high and low value currency denominations, respectively. This system was only effective as long as the value of both coins remained consistent. The 1848 California gold rush turned this entire system upside-down leading to a overvaluation of gold vs silver and ultimately resulting in the abandonment of silver currency in the financial crises of 1873, often called the Crime of '73. The economic impact of the crises essentially cut the money supply in half with gold inflating in value wildly. It became impossible to pay outstanding debt. The impact was most severe on the rural. The solution, as embraced by Bryant, was derived from a c. 1894 booklet entitled Coin's Financial School by 'Professor Coin' who advocated for free minting of silver coins and an abandonment of the gold standard. Most larger businesses, all of which were centered in the small but populous and powerful New England and Middle Atlantic States, were opposed to such a transition, believing it would disrupt the American economy. The American political scene was thus divided between rural areas, represented by Democrat William Jennings Bryan, who supported the unrestricted minting of silver coins, and the more industrial northeastern states, represented by William McKinley, who advocated for retaining the status quo gold standard. Thus the cartoonist asks 'Will the Tail Wag the Dog, or the Dog Wag the Dog' with the implication that the interests of the gold northeastern states, who were comprised of an economic and business elite, would come to dominate the silver states. 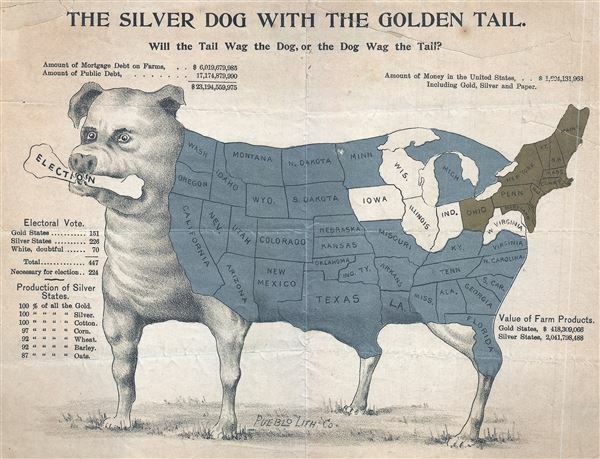 The 'silver dog with the golden tail' is essentially an electoral map with Democrats representing by the 'silver states' and Republicans by the 'gold states.' Ultimately, the economic superiority of the Republican Campaign, which appealed to big business to dramatically outspend their Democratic rival, resulted in a victory for Bryan. The gold standard was kept until the dark days of World War in the early 20th century. Curiously, with just a few notable differences, such as the west coast, this map is an exact opposite of the modern political map, in which Republicans control the bulk of what were then 'silver states' and Democrats all of what were then 'gold states.' This is a rather deluxe broadside version, featuring gold and silver foiling, of a political cartoon that first appeared in the September 13, 1896 issue of the Boston Globe. Such graphics, produced in many variants, were widely distributed throughout the American west, the 'silver states' to promote the Bryan agenda. Average. Backed with archival tissue. Some repairs splits and cracks.